Below are common attributes associated to Autumn Coral Encore Azalea. Become a care taker for Autumn Coral Encore Azalea! Below are member comments regarding how to plant Autumn Coral Encore Azalea. No comments have been posted regarding how to plant Autumn Coral Encore Azalea. Be the first! Do you know how to plant Autumn Coral Encore Azalea? Below are member comments regarding how to prune Autumn Coral Encore Azalea. No comments have been posted regarding how to prune Autumn Coral Encore Azalea. Be the first! Do you know how to prune Autumn Coral Encore Azalea? Below are member comments regarding how to fertilize Autumn Coral Encore Azalea. No comments have been posted regarding how to fertilize Autumn Coral Encore Azalea. Be the first! Do you know how to fertlize and water Autumn Coral Encore Azalea? Below are member comments regarding how to deal with Autumn Coral Encore Azalea's pests and problems. No comments have been posted regarding how to deal with Autumn Coral Encore Azalea's pests and problems. Be the first! Do you know how to deal with pests and problems with Autumn Coral Encore Azalea? Looking for Autumn Coral Encore Azalea? Get Autumn Coral Encore Azalea fresh and large directly from the grower to your garden! Buy Autumn Coral Encore Azalea online from the nursery wholesalers and save BIG! 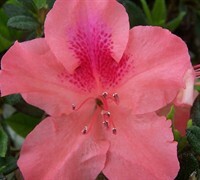 Encore Azaleas require very little pruning to retain good form and do not need "dead-heading." If you think your Encore Azalea needs pruning, do so immediately after the Spring flowering for maximum bud set. Use hand pruners to remove stray branches that spoil the shape of the plant. You can then prune lightly throughout the season after each cycle of blooms to encourage new growth. With Encore Azaleas, any time new growth is produced new buds are produced. New buds means new flowers. After each light pruning, fertilize lightly with a slow-release organic food or an azalea/camellia type fertilizer. This will also help to encourage more new growth and more new blooms.